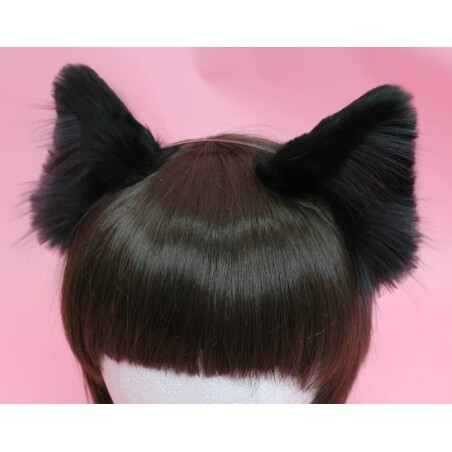 So I searched high and low for ears for a cosplay, I looked at every shop I knew of, and looked through new ones. I found lots of ears, but most looked too fake, too uncomfortable or they were made of wood.. I almost gave up and started thinking of another cosplay when I found a review of Kittens Playpen. I was a bit late to order the ears, I remember, and I was really worried that I wouldn't get them in time (As they'd have to be shipped quite far..), so I emailed them and asked. I was very nervous, as I rarely order things online, and it was my first time from KPP, + I never really contact the sellers. The one I contacted (unfortunately I can't remember her name..) handeled things extremely well! I had no reason to worry, thanks to her my ears arrived a week before I needed them, when they otherwise probably would have arrived a week too late :) It felt almost too good to be true! So happy with my ears, they are perfect and so soft and fluffy, worth the wait for certain!!!!!!! Can't wait to receive my other sets now! I love these ears so much!! There are elastic loops attaching it to the headband which is an awesome way to attach them, it makes it so easy to move them around. They took quite a long time to ship out, longer than I expected, but I still love them! These are my first ears, and they are superb! The material is pristine, super fluffy and soft, and they are posable! I ordered them with a black fox tail, and they look amazing together. I look forward to ordering more ears in the future, this quality simply cannot be beat! I received them about two months ago and they're still as fluffy and as beautiful as when i got them out of the package... I wear them everyday because they are soooo cute and they are my favorite ears. They are very comfortable and they sit perfectly ! These arrived and i was so impressed with them. The fur is soooo velvety soft! I like how you can manipulate the ears to bend them into which shape you want, and move them together or apart along the headband. The quality was amazing! The only slight problem was the unevenness of the ears. One was slightly tilted forward, but that's okay. These are my first ears from KPP and I'm in absolute love! I even got the piercings!